Niagara Falls are a huge (both literally and figuratively) attraction in their own right. But they’re also surrounded by a large number of other worthwhile attractions covering everything from games and theme parks, to go-karts, shopping and casinos. One of the more low-key attractions however, and a great way to get away from the hustle and bustle of the area, is the Niagara Parks Butterfly Conservatory. Whether you’re a diehard butterfly fanatic, or just curious about the delicate and colorful creatures, this is the place to go. Read on for everything you need to know about visiting. The Niagara Parks Butterfly Conservatory first opened to the public in December of 1996 and has been fascinating visitors ever since. Located on the grounds of the Niagara Parks Botanical Gardens not far from Niagara Falls, the conservatory contains a climate-controlled greenhouse with over 2,000 exotic butterflies comprised of 45 different species, as well as a gift shop, and a 200-seat auditorium. The conservatory was designed and developed as a way to educate and entertain visitors about the life cycle and habitat of butterflies. Niagara Parks Butterfly Conservatory is located on the Ontario side of Niagara Falls at 2565 Niagara Parkway, just 5 miles (8 kilometers) from the Falls. The conservatory is open daily year-round (except for December 25). Hours vary by season, listed on the website daily, so it’s a good idea to do a quick check before you set off. 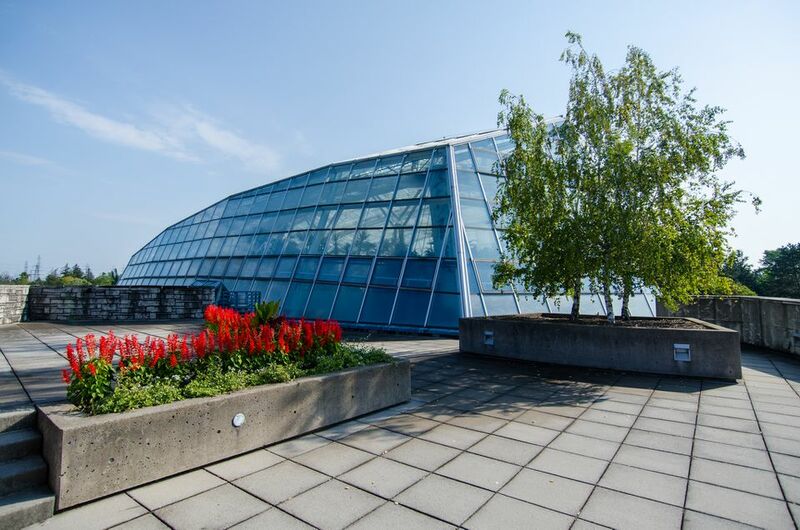 Though the Botanical Gardens are free to enter, there is an admission fee of CAD $16 for adults and CAD $10.25 for children (6-12) for the conservatory. Love butterflies? This is an attraction for you. Niagara Parks Butterfly Conservatory is home to over 2,000 exotic butterflies from around the world in a setting that makes you feel as if you’re in the middle of a tropical rainforest. There are 45 different species of butterflies here, flying and flittering through their climate-controlled environment. Many of the conservatory’s butterflies are imported from tropical regions around the world. And in terms of where they obtain the butterflies that you’ll see as you walk around, approximately 60 percent of the butterflies come from butterfly farms in Costa Rica, El Salvador and the Philippines, while another 40 percent are raised in a quarantined greenhouse located behind the conservatory. Since you’ll be surrounded by butterflies, if you want one (or several) to land on you, visitors are encouraged to wear bright clothes, wear perfume or cologne and move slowly in order to attract the colorful creatures. Basically, the exhibits here are the butterflies themselves, with the conservatory being their home. Upon entering the glass-domed conservatory you can take a self-guided walking tour, which starts with a short video presentation introducing you to the butterflies you might meet and the plant life you’ll come across as you explore. Then it’s all about butterfly-spotting and snapping as many butterfly pictures as you can (assuming they stay still long enough for a photo-op). There are 600 feet (180 meters) of paths winding through the tropical conservatory that take visitors past a pond and a waterfall before getting to the emergence window. The emergence window is where the butterflies leave their pupae (the stage before fully becoming a butterfly) and dry out their wings before they take their first flight. Most people spend an hour to 90 minutes walking through the conservatory. Since the conservatory is located on the grounds of the Niagara Parks Botanical Gardens, which are free to enter, it’s worth taking a look around before or after checking out the butterflies. The gardens comprise nearly 100 acres of landscaped gardens, including perennials, rhododendrons, azaleas, herb and vegetable gardens and a huge rose garden filled with well over 2,000 roses. If you’re going to visit the butterfly conservatory, it’s a good idea to build in time to explore the Niagara Parks Botanical Gardens where the conservatory is located. In addition, since the conservatory is located so close to the Falls, there’s plenty to explore in the area. This of course includes Niagara Falls themselves, as well as Clifton Hill and its myriad attractions, Niagara Skywheel, Canada’s largest observation wheel; Niagara Speedway, North America’s largest elevated go-kart track; Bird Kingdom, the world’s largest free-flying indoor aviary; Great Canadian Midway, featuring over 300 games; and much more.